UPTOWN — If Alfred Hitchcock were scouting locations for a sequel to the 1963 classic "The Birds," Uptown would be the ideal setting. That’s because the birds — more precisely, the pigeons — are back. Of course, the pigeons never really went away. But the scandal involving Ald. James Cappleman (46th) and a neighborhood woman known as “the pigeon lady” came to a head two years ago — when the woman allegedly shoved the alderman after he tried to brush bird feed off the sidewalk near his office — and has since died down. 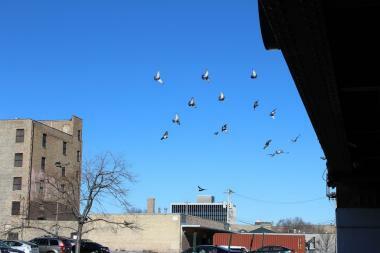 “I’ve noticed it all summer long,” Littleton said of the increasing numbers of pigeons in the neighborhood. Littleton said he often saw flocks of pigeons in a parking lot near the mural on Lawrence Avenue. And while Littleton said “the pigeon lady," a well-known Uptown resident, has still been seen feeding pigeons in the neighborhood recently, he said she’s only a small part of the problem. Emily Wood, president of the Argyle Winmore Block Club, said the pigeon lady left a variety of food items for the birds, including leftover cooked dinner, rolls and noodles. “Anything that’s wet and cooked, it’s just revolting,” she said. Confronting her is exactly what Wood says she believes is the key to finding a resolution. She said unless police stake out areas near the pigeon lady’s Uptown residence, she fears little to nothing can be done about the situation. Wood said she’s spoken with Cappleman’s office about the issue, but because of the ward zone boundaries, she and her neighbors are stuck in a bureaucratic gray area. For that reason, she said calls to Cappleman’s office have been “relatively unsuccessful.” In the past, she said, she’s considered calling 48th ward Ald. Harry Osterman for assistance. “But it’s not in his ward, I mean she is in his ward for sure, but that whole street is kind of a no man’s land where it’s hard to get any traction either way,” Wood said. Though the pigeon issue made citywide headlines in 2012 and 2013, Littleton said he thought the neighborhood needed to come up with control strategies similar to those used on rodents like rats.